No one in Nashville ever plans to lose a tooth, but adult tooth loss is prevalent from injuries, accidents, or gum disease. Once your tooth has been lost, it is important to find a tooth replacement as soon as possible to restore the aesthetics and function of your tooth. Have you ever considered that eating, talking, laughing, and smiling all require the use of your teeth? At the Nashville Center for Aesthetic Dentistry we provide dental implants or dental bridges to replace your missing teeth. 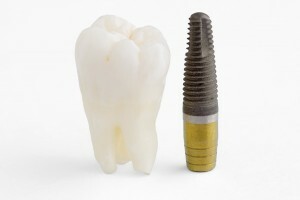 A dental implant is one of the most effective tooth replacement solutions, with a high success rate around 95%. Unlike other restorations, a dental implant replaces the tooth root with a titanium rod, which helps keep the bone and gums strong and provides natural chewing support. Nashville dental implants are most commonly capped with natural-looking artificial teeth called dental crowns, which are contoured to match the look and color of your surrounding teeth. While the dental implant procedure takes several weeks to heal, it is known as one of the most long-lasting tooth replacement options. If you do not have sufficient bone mass or do not qualify for a dental implant, a dental bridge is another common tooth replacement in Nashville. A dental bridge fills the tooth gap with a natural-looking tooth that is supported by the adjacent teeth. Both tooth replacements allow you to eat normally again and enjoy a high quality of life. To learn more about the option of implant dentistry or dental bridge, contact the Nashville Center for Aesthetic Dentistry in Nashville at 615-371-8878 to schedule an initial consultation.